Imagine getting in your car in the morning and having it drive you to work while you answer e-mails, send text messages - or nap. Fortune magazine reports on the so-called driverless revolution; and how self-driving cars could soon affect ordinary Americans and a wide range of industries. 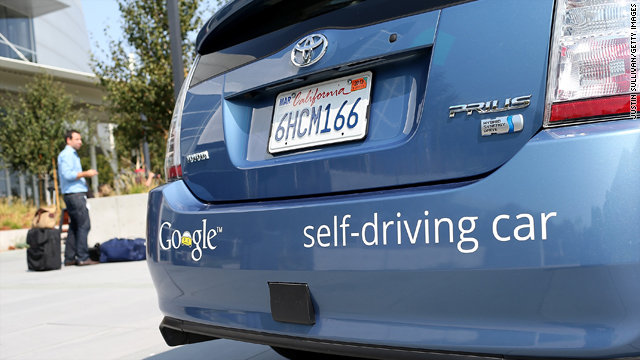 Google's fleet of self-driving cars have already traveled 300,000 miles. There have been no accidents when the cars were controlled by a computer and only one fender bender with a human behind the wheel. These customized cars use a combination of GPS, radar and a 3D mapping camera on the roof that can see traffic signals, lanes and pedestrians. Cars that drive themselves are coming - it's just a question of when. Most of the big car makers are working on self-driving models. And three states - California, Nevada and Florida - have already made self-driving vehicles legal - as long as a human is sitting in the driver's seat in case of an emergency. Meanwhile these cars could boost worker productivity since the average commuter spends 250 hours a year behind the wheel. Or they could come in handy after you've had a few drinks. Self-driving trucks could also transform the trucking industry. Just picture long lines of self-driving 18-wheelers traveling down the highway just a few inches apart: no drivers, no stops for gas or food. It could boost fuel efficiency by as much as 20%. We'll need to keep driving ourselves for a while longer, though: experts say driverless cars should be more common in another 10 to 15 years when costs come down. Here’s my question to you: How would you feel about riding in a car that drives itself? I can't wait to get back to bar hopping again without getting a DWI. Nevada has already approved the use of the driverless car, and this could also be used for 24 hour taxi cabs as the technology is perfected. Computers & robots will eventually perform all of the work and duties that we humans currently perform. WHERE ARE THE JOBS? Thanks to our obsession with cell phones, texting, GPS devices that tell you to drive into lakes, and anything in general that will make you more likely to turn your car into a $30,000 tree decoration, most cars already drive themselves in a sense. Why not? I'll take HAL 9000 over Joe Six Pack and his lead foot any day. I wouldn't have any problem riding in one as long as there was a computer override button. At this point these cars have operated only on specially constructed roads. Consider how the car recognizes that there is a stop sign at an intersection that doesn't emit some kind of signal or a roadway that narrows to one lane. There are major hurdles to overcome before this kind of programed car becomes commonplace. With the recall incidents in the news as often as they are I would not feel safe. Equally important is the concern that the car in malfunctioning, might injure or kill someone. Would I tell their family, I didn't do, it my car did! I don't think there will be a difference, after all they are made by men who are drive cars rapcious animals, and by women who either drive like a clueless blonde, or about as slow as Granny taking a Sunday Drive. Add the defects that come with automobiles these days, you have a uncontrollable danger at any speed. Maybe when I'm 80, but not now. I like to drive. f it solved the problem of driving under the influence of alcohol, texting, talking on the phone, and shutting up my wife the back seat driver, it would be WUNDEBAR. I would rather that it had control and power through a central computer system. Indeed, if I could call for such a car to take me to the train in the morning and not have to pay a guy to drive it, so much the better. Fantastic...until some 12 year old on his iPhone decided it would be funny to hack into the computer and send me down the freeway at 100 mph. Sure, as long as the mapping isn't powered by the iPhone. . .
Jack, that sounds good until a glitch kills scores of drivers. We can't even make an electric car let alone cars that drive themselves. Maybe in another 20 years. It would take some getting used to to gain my trust, but I won't be the first on by block to purchase one. I will have to pass on this.. It does not mater how smart the car is when it has to function among other drivers and pedestrians that it can not possibly predict. It sounds like a nice idea but unless it is going to be made out of rubber to bounce off of what ever hits it then it really is just an expensive gadget. We have these already and have had them for years. They are called a taxi. Jack, most men had rather do that than drive themselves with their Mother-in-law in the back seat! No way, no how, never, never, never. I don't even trust cruise control in my car. Why not if the car does something wrong than you can tell the cop I didn't do it the car did. Then you can sue the car maker for a production defect. Ya that's it it's not my problem the goal of to many. Ok, as long as it is not texting. Thats not going to happen, so I will never know. Doug, Pepperell, MA. approach to most things. That's why I've never used an ATM or a CELL PHONE or an IPAD. I deal with a teller at the bank, use a land-line to make calls and the post office for correspondence. That makes a self-driving automobile out of the question and over the moon for me. Well it would be a damn sight safer than riding with the majority of the people who have conned the DMV into giving them a license. Some people should never, ever, under any circumstances, be allowed to operate a motor vehicle. Already done with pedal to metal, next will be bungy jumping with Grover, should be a real hoot! More to the point, I wish EVERYONE had to ride in self-driving cars, so crummy, unsafe drivers became a thing of the past. Jack: It would take sometime to get use to a car without a driver. Confidence would be key to a car without a driver. An outstanding safety record over 5 to 10 years would help a great deal;. I would get use to it. I think it is great move forward in technology. Dreaming, just dreaming about imaginary things. Things, just things, that don't mean a thing. Oh by the way, Jack, since you asked, if this imaginary questioned you posed were a real possibility, I would have to say considering my almost perfect driving record, I just wouldn't feel near as safe as when I'm driving . Whilst I'm dreaming could you offer some question of real relevance, in some real universe, in the near future ? I do have a question for you Jack. Do you like apples ? Obama Won ! How do you like them apples ? There are enough problems on the road now without adding something like that to it. Like a 3 year old child again, except orphaned. You, the driver, the citizen, has no input to anything, it's all done by the Wizard. I'd feel a lot more comfortable with a computer-controlled vehicle than with some of the human drivers I know. Besides, there's zero chance the robot would be DUI! I'm okay with it. But it is the other idiots on the road driving their cars that make me nervous. Great if it came with an unlimited prescription for Valium. Plodding along at a prescribed speed and following distance would drive me absolutely nuts. Same as I feel riding in an airplane that flies itself. Safe. I would like to see one driven by all of the twenty something women who put on makeup, drink coffee and talk on their cell phone while "driving" to work in the morning. They could install vanities for them as well. This could be great. And a heck of a lot safer for everyone else on the road in the morning. It can't be any worse!! I'm a control freak. I would not do it. I have driving-on-highways phobia and am a horrible driver even on the back roads. So, everyone would be s safer if I were behind the wheel of a car that drove itself. Perfect! No more DUIs. And if there is an accident, you couldn't be charged, because the car did it. Even better for all the lawyers out there: endless possibilities of litigation and class action suits. That's what we need. I'm tired of the idiot drivers on the road. A self-driving car doesn't do drugs or get drunk and cause wrecks or deaths. It isn't susceptible to road rage and it knows the shortest CORRECT route to the destination. Give me that, any day. At my age I would have no problem at all. If I had a car that drives itself I would fire my chauffeur......Wait a minute, thats me! I flew airliners for YEARS where the autopilot did 90% of the work. aircraft now days are SO sophisticated that after takeoff "Otto" will climb it to altitude, fly the route to the destination, do the decent and approach and even LAND. all the pilot does is "monitor" it's performance. in fact, when there is close to zero visability at an airport, the flight crew is REQUIRED to use "Otto" for the approach and landing because it's MORE precise than "hand flying"
A lot safer then when my wife is driving. It might be better than my wife and certainly better than non-english speaking cab drivers from 3rd world countries! The only question about all this automation is one of liability. If Google's car hits a pedestrian while I'm in it, will they come after me? If the car gets into an accident and I'm traumatized, is there recourse? Safe. They should be made mandatory for every driver over 70 years old as soon as possible. The pictured car is a Prius which is what I happen to drive. While my Prius has never done anything strange, I don't think that I could ever totally trust a car to drive itself. There is a stop sign a couple blocks from my home which drivers blow through most of the time and we have black ice, snow, roundabouts and aggressive drivers, so I think I'll leave the driving to myself. I have enough trouble riding with other human drivers without wondering if the programmers got it right. I wouldn't be comfortable. gives a whole new meaning to "Blue screen of death"
I think it is a great Idea. I love to drive, but if I live long enough there will come a time when I am not able to. A safe self-driving car could give me independence for a longer period of time. I can think of several places where self-driving cars could be advantageous. Individual tours – rent the car for a week and go where-ever on your own schedule without getting lost in a strange city or country. Maybe I should start putting together a business plan. My mom is 92 and the doc told her to quit driving. She's devastated. I don't think she'll last more than a few months now. A self driving car would mean she could remain mobile and active and would prolong her life. So, I guess I'd like to see them. Hi Jack, overall, it might be safer if cars drove themself as long as we don't give them cell phones and make-up to call other cars and make give themself a make-over while on the road. We don't get to pilot the commercial planes we fl on, the trains we take, or the ships we take a cruise on. Leave us something we have control over. If it's progress...great....if it creates jobs even better. Totally would! I am fine with that. If it increases safety and is reliable I will! It couldn't be any less safe than all the texting drivers, tweeting drivers, phone drivers, and drunk drivers on the road. I can't drive in a car driven by someone else, and you want me to drive in a car driven by no one? Thanks, I'll take the bus. I would LOVE it! As long as the technology proved as reliable and safe as rail, etc., I'd be more than happy than to sit back, sip my coffee and read the newspaper to and from the way to work. Better still for evenings out on the town. I just hope that the car doesn't develop a mind of its own, like so many scientific horror stories and shows feature. I would enjoy self driving cars as long as there is a manual override so I can drive myself when I want. Imagine all the lives that will be saved since human error is the main cause of current car crashes. Jack, cars that drive themselves will also be equipped with anti-crash technology eliminating the need to purchase any car insurance. Think of the lives and money saved not having to deal with car crash victims. i'd feel a lot safer on the road having a car doing the driving for old people like you Jack, rather than you doing the driving! Well, Jack, If I was a truck driver, I wsould be afraid technology was going to take my job. Jack when you started talking about something driver less I thought your were talking about the Republican party. Didn't work to well there and like you I don't expect it will work to well on any of our failing infrastructure around the country. With the computer in the car is VERY locked down. NOT a single problem with it – I WANT ONE !!! I don't think it'll be much different. There are many cars on the roads these days without a brain behind the wheel. I'd rather have cars that drive themselves than cars driven by people who are busy texting. I know about 535 folks in congress that can't seem to drive anything to completion who are likely thrilled with this driverless model. Who gets a driver's license, Robo-car or human? Great, what are the unemployed truck drivers, bus drivers, delivery and taxi drivers gonna do ? Is this part of the 12 million jobs romney was gonna CREATE ? Who would be responsible for an accident? How many jobs would be affected? What would be the cost? Who really gives a crap!!!!! Have we really become this lazy? I will never own one of these cars. I feel safer driving myself. Heck, I am 75 and my wife is 73. I love cruise control and she doesn't trust it! Age reduces your eyesight for night driving. I am all for it. Problem. Probably could not afford that car and/or would be dead by that time!! It's not so much the safety I would feel if my car drove itself, but rather the safety brought about by other people not driving their cars! This technology could drastically reduce the number of innocent travelers impacted by the poor decisions other drivers make. What about left turns when you have to yield? Or merging onto a freeway when someone cuts you off? I would not be able to do anything behind the wheel except watch what the car was doing, so there's no point. I just couldn't trust it. So Jack, if the car is driving you down the freeway and it's computer crashes, does your windshield turn blue? I'm from NJ where people obviously never learned how to drive. I'd prefer a computer driving my car to help me avoid the morons with no common sense and obviously no driving ability. Bring it on tomorrow. I'm in. Self driving cars? I am not real sure for myself but what great news for Lyndsay Lohan! Jack this technology is limitless, with goverment vehicles like ambulances being so under staffed if we can perfect this technology I think I'd would be as comforable if not more comfortable driving in one of those cars. With all the texting and drunk driving, I couldn't fathome these cars being less safe than some of the irresposible drivers we have. That would be great. Think about the things we would not have to worry about, drunk drivers, people texting, talking on the phone, eating, putting on makeup, that is just to name a few things. Bring on the self driving cars lets just hope they don't develope Road Rage!!! what do you mean future car? From my vantage point there are drivers out there that think they already have one. All drives should take a test every year. Good revenue for the states and a learning curve for the clueless. I'd love it! It would mean stupid drivers would no longer endanger the lives of others!!! It would be awesome! I'll be too old to drive soon and it would be great to still be able to use a car. Also think how many things you could be doing while waiting in traffic: read, email, sleep, and even, yes, watch you on TV! Hardly can wait!!!! I would be totally fine riding in a driverless car. To think of the reduction in accidents due to elderly drivers or alcohol impaired drivers as you commented on during the broadcast is a huge selling point. Elderly people who lose their driving privilege because of age or health issues would still retain their independence. As a 16 year old who recently got my license I think I would put more faith in a computer to control my car and the cars around me rather than myself or other people. Although driving is fun, a future with autonomous cars would substantially reduce the amount of car accidents and It would be in general a lot more efficient. Jack- In California lots of cars are already driving themselves.....while the designated driver is merrily texting away. Not very. In case of an accident do I pay, the car mfg or CalTrans. Having the car drive itself is a better choice than a Tea Party Congressman, but Elizabeth Warren or most Democrats could avoid the cliffs chauffeuring America. This is the greatest innovation since the wheel! Now, I can take a nap while driving and feel safe. Fair is fair though, will the car have to take a driver's test and eye exam? If a cop stops me, I'll tell him the computrer did it. No question about it, life will be better. Now, if I could only find a computer that can cook! Today's technology is going too far, not being in control of your own car is a lack of responsibility. As a driver you are counting on the other drivers to be repsonsible. These cars being controlled by computers is a terrible idea, as we all know technology does make errors. Can we put our trust and even our life's or other's lives in the hands of a computer that could make an error and be Disastrous? I think computer controlled cars is a ridiculous idea that contains lack of responsibility and a content feeling with technology as humans. For the elderly who are no longer considered safe drivers, it is difficult to give up the independence a drivers license provides. This will be a godsend for them. I hope we get it before I get to that point. Bring it on! The question should be how does one feel being NEXT to a car that drives itself? I would just find another way home, if there is any left else I will just have to grow wings and fly. I would love it, and trust it – humans make careless mistakes far more often than computers. Just think: No more DUI related deaths, no more traffic related stress. Long day at work? Sit back and relax on your ride home. Loath long travel to visit family for the holidays? Not any more... I'll buy one as soon as they're produced at a reasonable consumer price point. I already have self-driving cars. I never remember driving to work early in the morning, but my cars get me to work everyday because they know where my work is. You just have train them properly. Oh Heck yeah jack! I’m all for anything that gets me more recliner time. Besides, a self driving car will go real good with those marijuana fishing trips in Colorado. Who can deny progress? I support robo-cars. They will let me eat tacos and txt at the same time! J#4. Austin Texas! Google already maintains my search history, my email accounts, a record of YouTube videos I've watched, knowledge of where my Android phone is at any given time and details of what I look at on nearly every web-page (Google-Analytics). Giving Google the right to know where my car is, what it's doing, and what temperature preferences I like my air-conditioner at while driving is just too much. The price of technological convenience is growing, and the near omnipotent monitoring capability of these private companies should scare everyone. Say "NO" to Google-cars. I love to drive, and will not trust a computer to do if for me. Heck, what about all the places that aren't even on Google Maps? It's not like we all live in the cities. What happens when a deer runs out in front of my car, blizzard conditions in rural MN, or when I want to go ice fishing and drive out on a lake? Is it not going to let me? No thanks. My husband is an engineer, and his master's thesis was designing the control system (ie steering and how the vehicle stays on the road) for an autonomous vehicle. He was part of a research team that also designed adaptive cruise control and operation sensors. He's been trying to get me to let him put his controller on our cars for a decade. There are multiple research teams at universities all over the country who have been working on "autopilot" for cars for years. It's about time the industry start using the technology. After all, aren't we supposed to have flying cars by now? What ever happened to concern about exposure to radar radiation? Just ask a policeman if they worry about being stuck behind a radar gun or ask those who worked on the Northern Shield Radar Installations during the Cold War. Ask a radiologist at the hospital if wearing a lead lined smock is important when giving X-rays or if those radar exposure badges would be a good idea when all those cars start exposing the public to cancer rays. They are still testing survivors from Hiroshima and Nagasaki and are finding many suffer from sterization. How would I feel about riding in a car that drives itself? ; afraid and angry! Riding in a car that is doing the driving sounds like a nightmare. If you have ever seen the video of the woman driving her car at 100 mph and dodging traffic with the gas pedal stuck, you would never climb in and buckle up for a computer to drive you to Grandma's house. We already have a lot of cars on the road that drive themselves while the person sitting behind the wheel is doing everything else. Besides that, insurance companies will probably increase their rates dramactically, no thank you. "Auto pilots" have been flying the airways for quite awhile now. It's about time " auto drivers" enter the freeways. 1. it's guaranteed there will be far fewer accidents. No, there won't be zero accidents: it's not a choice between the accident level we have now and zero; it's about greatly reducing the level of accidents. 2. it would be possible to have fleets of vehicles from which you could call up one to come to your house and pick you up. You could order the type of vehicle you need for the current need: a small one to go to work, a medium one for grocery shopping, a truck for going to the DIY store; They could even replace busses and trains for commuting. 3. it's a technology that's coming. If the US rejects it, the rest of the world will implement it, save tons of money, and gain a significant economic advantage. There are many other benefits. Yes, it will be a sea change, but it's coming; better to get out in front than suffer the consequences. I became legally blind in 2002. Although I am highly functional (think Mr. Magoo) in NY i lost the ability to drive legally. It would be a releif to have my independance returned and not have to rely on public transportation, taxis and my spouse to go anywhere. I would buy one tomorrow! Jack, with all of the new marijuanna laws coming, it's probably not a bad idea. Seeing as how I work in the area where some of these cars are being created I'd have to say they are a step into the future. You might actually be surprised how many times you've pasted or been pasted by one in the last 6 months if you live in the Pittsburgh area. Would I get in one. Yes I would. However, the real question I see needing to be asked is how many jobs will be replaced by the system that replace the human factor? I see more than just truck drivers losing there place of work. Bus drivers,trains, you name it. There are literally hundreds if not thousands of jobs that could use this technology to X out the human factor. Thank goodness......now people can rid themselves of one more hurdle that prevents them from texting 24 hrs a day. . Frankly, here in Houston I wouldn't ride in one unless 100% of the cell phone using, tweeting, texting drivers were also in one. Three wrecks in my life, each while sitting at a red light and hit from behind by one of these electronic gadget addicted fools. Of course Jack and I think Americans will too. We rely on all sorts of things to do for us who we did for ourselves. Audio books read to us. Microsoft Office keeps our spelling in check. Facebook is maintaining our friendships for us. Partisan news networks and talk radio have even been providing subjective analysis for years so we don't need to think anymore. What's wrong with a car that can take me home after I pound one martini too many? Plus, I need to post great Blitz status updates on my Facebook, while spelling correctly, as my car drives me home. I'm tired of driving with my knees. I guess the driver's here are ahead of their time ! Americans are too impatient for this to work in everyday commuting. The idea would probably be most effective in commercial use. How do we interact with the car? Me and the wife argue, so it can't be by voice command. Who knows where we would end up? I'd finally feel like Romney and the rest of the 1%... Dont they have chauffeurs? It'd be like riding in CHITTY CHITTY BANG BANG or in HERBIE or in Supercar! I hope I could trust, due to all the recalls lately. As long as the GPS is installed correctly. And there would be no recalls! Could I send it out alone to pick up pizza? Will it swerve for squirrels?